Minamishinshu Dunkel Weizen was a present from a friend of ours to celebrate six months of BeerTengoku and has been eagerly awaited since it was given to us. Minamishinshu Dunkel Weizen, as the name suggests, is a dark wheat beer style based on a German style of beer that is best drunk in Spring or Autumn. Bananas and roasted malts in one glass. Minamishinshu Dunkel Weizen is one of those beers that comes out of nowhere and surprises you in a pleasant way. Out came the weizen glass and the pour was treated with respect as after the last beer, I was wary of sediment, particles, aka bits of stuff, floating in my glass. There was no disappointment with Minamishinshu Dunkel Weizen. A thick dark brown body was topped with a relatively small amount of head for a weizen, though it did last for a while and was quite thick. This glass is specially designed for weizens to help promote the aroma but Minamishinshu Dunkel Weizen didn’t need it. A complex amount of aromas came through the head; bananas, wheat, roasted malts, coffee, chocolate, and caramel were all noted and all are easily distinguished. It’s like being in a sweet shop of aromas and deciding which one you like most. 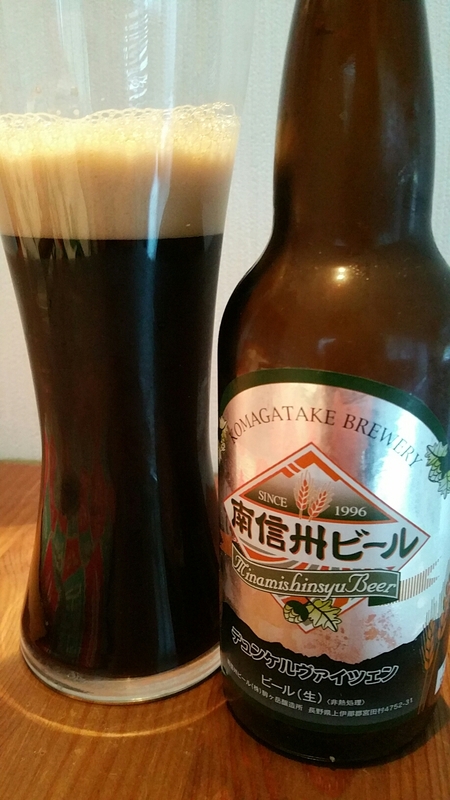 With something smelling so good, Minamishinshu Dunkel Weizen was begging to be savoured but I couldn’t. That first sip, well more of a gulp, was beautiful. Light roasted malts with yeast come through that are balanced with a rich, velvety body. The flavours linger on the palate but never overstay their welcome. Minamishinshu Dunkel Weizen needs to be tried. Simple as. One of my new favourite beers that I will happily order and drink again and again. Minamishinshu Dunkel Weizen can be bought from the Minamishinshu homepage here. It can also be bought from Sakaya Okadaya here, from Crafbeers.jp here, or as part of a set from GoodBeer here. We’ve also seen it in Nomono in Akihabara and also Le Collier in Tokyo station. I did not like it so much. The weizen taste was not there, the roasted malt and coffee tastes were overwhelming. More of a stout than of a weizen, I would say.